Recently someone asked me “Don’t you ever sleep?” The answer to that question: Sometimes. The reason for that question: We’ve got two events this week. + My other baby Summer Smash will gather and party for the last time Thursday-Saturday. That’s right kids, it’s the last smash. Thursday night at the Lager House will feature a Handmade Detroit All-Star stocked store. All proceeds from the fest (and we do mean all, the bands donate their performances) go to the CAID’s non-profit arm. 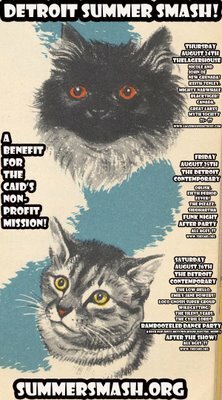 In other words, Summer Smash 8 is supporting the wide range of artists in Detroit. A full lineup of all the super bands is at our web site. If you recognize that poster as familiar, it’s because Matthew, famous for the DUCF kitty poster, also designed it. + Handmade Detroit will also be tabling at the WolverZine Fest on Saturday the 26th. We hear that the Waiting Line Theory and Bittersweet Dream kids will also be in tables, and a list of the crafty and ziney peeps is also in on the site.